The Moncenisio variant of the Ciclovia Francigena (until recently called the Ciclovia dei Pellegrini) (Eurovelo 5) passes through Liguria from Piemonte. This is an excellent route on quiet roads which reaches the coast near Chiavari and then heads, more or less along the coast, towards the Cinque Terre and La Spezia before crossing into Toscana near Ameglia. Highly recom­mended. The Via Pedemontana. This route on quiet roads will follow the arc of the Alps from the Tyrrhenian to Adriatic seas, reaching the Tyrrhenian coast at Savona. Although this route is still, so far as I can tell, officially a proposal, it exists on the ground and you can follow it. The core section is the Laghi di Lombardia route (see my guide: Lakes of Lombardia and Piemonte). More inform­ation on this site soon. The EuroVelo 8 passes through the region, crossing the border with France at Ventimiglia before heading inland and then crossing back into France and heading through the Vallée des merveilles before recrossing into Italy via the Colle di Tenda (Col de Tende) on its way towards Cuneo, and from there towards the Po. 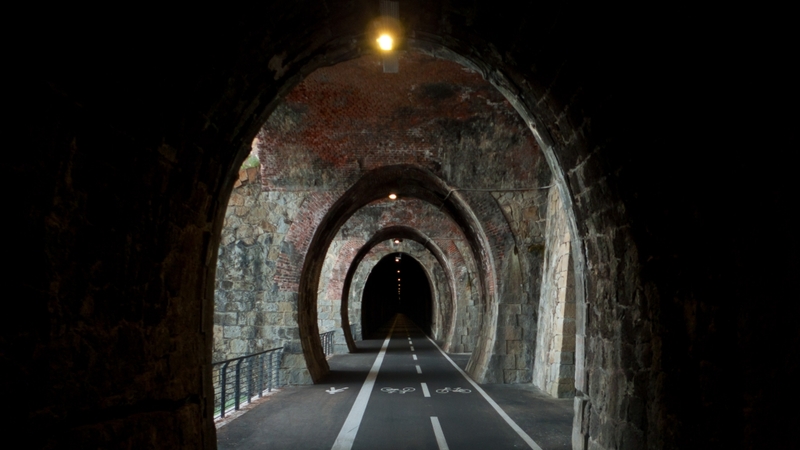 It's important to note that bikes are banned from the tunnel and at Tende you have the altern­ative of taking the train or a steep gravelly climb to the top of the col itself. The best of Liguria's cycleways is undoubtedly the Cycling Riviera (Parco Costiero del Ponente) cycleway which runs for 20 kilometres between San Lorenzo al Mare and Ospedaletti passing through the San Remo. The final four kilometres to take the cycleway into Ospedaletti were due to be completed in late 2013 extending the cycleway to 24 kilometres. The cycleway must be one of the best in the whole of Europe. It follows the course of the old railway line that ran along the coast, and is entirely traffic-free. The cycleway has opened up areas of the coast that were previ­ously completely cut off by the railway line. Built to a high standard with imagin­ative planting, it is 24 kilometres of pure delight and deservedly very popular. The next section of the line to be completed is the 19.5 kilometre section linking Andora with San Lorenzo al Mare, due to open in 2014. Sections of the old line are already included in the region's plans for the new cycleway, linking with the Cycling Riviera. The construction work on the new cycleway will no doubt take a few years. Further sections of the new line are planned - opening up the possib­ility of more cycleways as part of the Greenway Del Arco Ligure (see 'the dream' below). 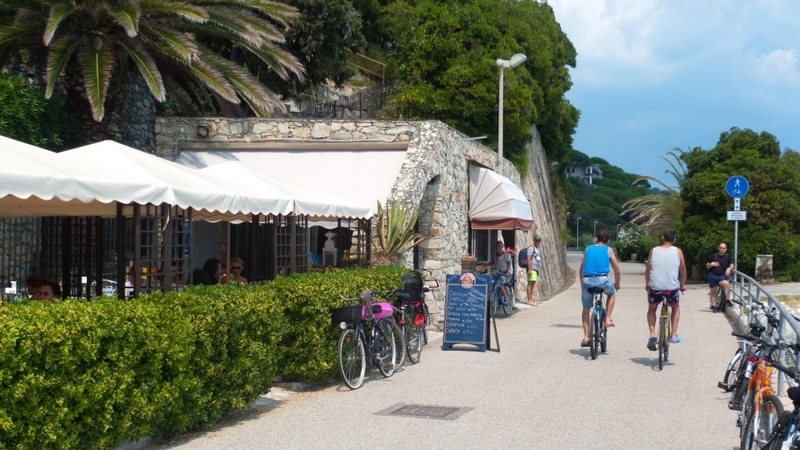 The other main cycleway in Liguria is the 36 kilometre Ciclabile del Ardesia which connects Chiavari on the coast with Donega, it's a mixture of quiet roads and unsur­faced cycleway. It forms part of the Ciclovia Francigena (until recently called the Ciclovia dei Pellegrini) (EV5). There's an article, with lots of pictures on bellitaliainbici.it. The Regione is also creating a Via dei Monti (Way of the Mountains) with the via Pedemontana and the Ciclovia Francigena (until recently called the Ciclovia dei Pellegrini). 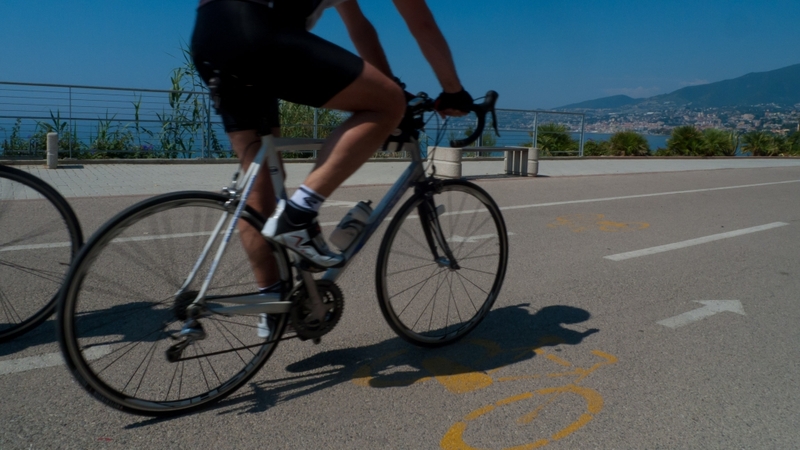 This includes plans for a 367-kilometre cycleway/​cycle route along the coast called the Greenway del Arco Ligure, which will build on the flagship Cycling Riviera cycleway. In addition there is a 120-kilometre Via dei Monti that will link to the Ciclovia Francigena (until recently called the Ciclovia dei Pellegrini) as it passes through Liguria from Piemonte en route for Toscana. 553 kilometres of the network are already in place (of these 70 kilometres are on traffic-free cycleways) and a further 82 kilometres are in the planning and design phase. The next stage of the construction of the new rail line is the 36.5 section linking Andora – Finale Ligure. The project is at the advanced planning stage, but hasn't been given the final go-ahead. 25 kilometres of the new line run through tunnels so it will be very expensive (1.5 billion euros) - it's an important long-term strategic project but in times of austerity it's not certain that it will go ahead. 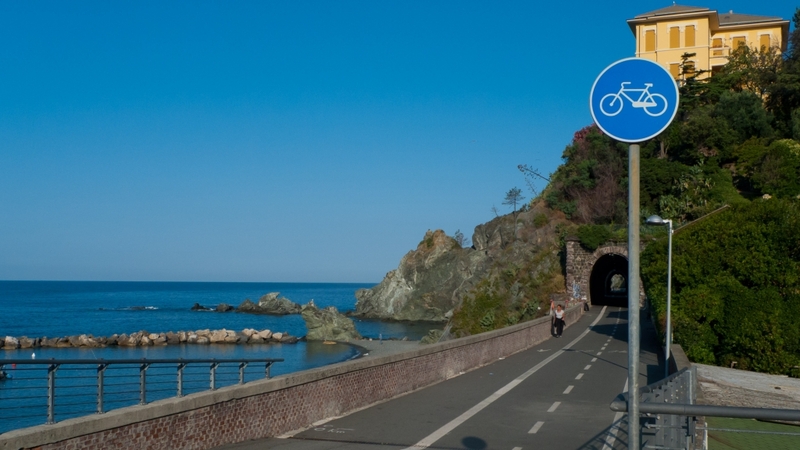 From Genova the planned route would head inland to link up with the ciclabile del Ardesia cycle route and then the route taken by the Ciclovia Francigena (until recently called the Ciclovia dei Pellegrini) or with an inland option of quiet roads. The vision is a great one, the Cycling Riviera is a great start. But the plan is a long term one and there are lots of obstacles to overcome. 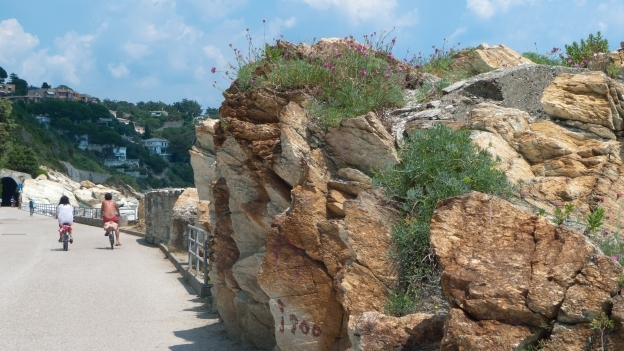 While the cycleways on the riviera Ponente are great examples of what is possible, the other side of the coin are the sections of the coastline where bikes are banned from the lungomare (beach­front promenade). The reasons are obvious enough, many of the lungomare are relat­ively narrow, and heaven knows the long suffering Italian pedes­trian deserves a decent break, but the problem is that many were built fairly recently so it's difficult to see the local councils spending money to widen them for bikes, or altern­at­ively reducing the numbers of parking spaces (which are a signi­ficant source of income). The other question mark is the links between the coastal towns - you can cycle along quiet streets within the resorts, but to get from one resort to the next means going back onto the main Via Aurelia an it's often difficult to see how the road could be made more bike-friendly without very expensive construction work.